Geek life in a one-income household takes effort. Here’s how I do it. If you cosplay frequently, you’ve probably made a million pairs of boot covers to go with every outfit. It’s no surprise that our favorite fantasy characters tend to wear shoes you simply won’t find at the local shoe store. But this leaves you sitting at the sewing machine barefoot, repeatedly trying your boot cover on with your shoe to see if it fits, if you can get it on and off easily, and if all the seams lay just right. Wouldn’t it be nice if you had a dress form for your feet? Well, I’ve got good news. 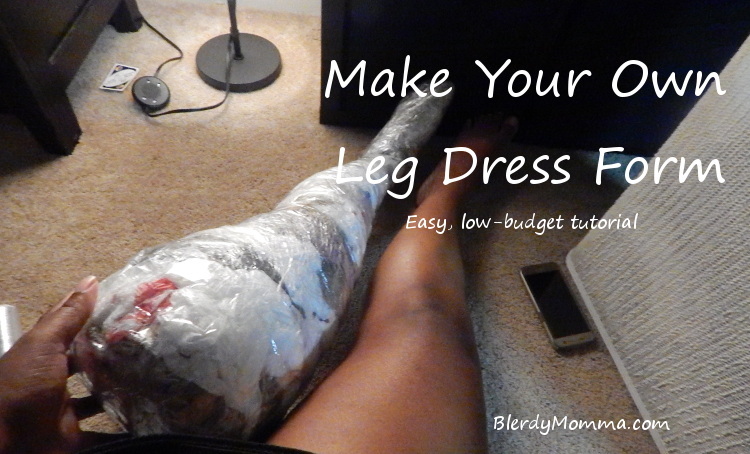 You can make your own CUSTOM dress form of your leg and it’s dirt cheap to do! If you’ve got a friend to help, you can get it done in less than an hour. Check it out. Go over the saran wrap with the packing tape. Wrap it snug, but not so tight that you’re cutting off circulation. (If you wrap it too tight, step 4 WILL become dangerous.) Make sure you don’t miss any spots. Lay the tape in different directions for full coverage. Take a permanent marker and draw a straight line down the center back of your leg wrap. Add a few hash marks across this seam. They will be useful later. Draw another straight line around the top edge of the wrap. CAREFULLY<<!!! Cut along that center back line you drew. It is probably safer to let someone else do this. And definitely use a pair of scissors and NOT any sort of single blade tool. If you have a pair with a rounded, blunt tip, that’s your best bet. SAFETY FIRST!! At this point, you should be able to slide the wrap off of your foot while maintaining its shape. It’s time to start stuffing! Ball up your plastic grocery bags as tight as you can and stuff them into the toe of your taped leg form. Once you have filled the foot area, line up your lowest hashmark and tape the seam back together using a piece of masking tape. Take time now to stuff the ankle of your leg form. It’s important to make sure the foot area is stuffed firmly but not so tight that you distort the shape. Line up the rest of your hashmarks and tape across them with the masking tape. Now you can finish stuffing your leg form. It should be firm enough to hold up to light pressure without collapsing. Go over the back seam with packing tape to make sure it’s secure. I usually do several strips going across and one or two going up the full length of the leg form. Tape across the top as well. Your DIY Leg Form is now Complete! You should be able to fit this leg form into whatever shoe you plan to wear under your boot covers and then use it to rough draft a pattern, design a mock-up, or test the fit of your boot covers repeatedly. This is also a great tool when you need to paint a unique design on leggings or tights for a cosplay. Wear shorts so that you capture your true leg shape and don’t have any obstructions. For some fun, go pick out a roll of duct tape with a fun pattern on it and cover your finished leg form with it. I made one covered in s’mores print once! You may want to make two leg forms: one for a flat shoe and one for wearing heels. When making the form for heels, point your toe while wrapping your leg. I’m happy to answer any questions you have in the comments below, or you can share pictures of your DIY leg dress form with me on Facebook, Instagram, and Twitter!